Delineating the process of guidelines is the fundamental step that should be agreed upon prior to working on the details of the guidelines. The Lung Cancer Guideline Committee agreed on the process described below in order to develop framework of the Committee. Experiences of other organizations in developing guidelines have been taken into consideration. The Lung Cancer Guidelines Committee developed 2008 Lung Cancer Management Guidelines based on available evidences in the literature. These guidelines are stage-dependent and addressing the most common clinical scenarios. They address diagnosis, work-up, treatment, and follow up of lung cancer. Lung cancer ranks first in the world in incidence and mortality. Multiple risk factors have been identified and the majority of lung cancer cases are preventable. This manuscript presents a summary of the epidemiology of lung cancer and the risk factors. The proper handling of a lung specimen by a competent pathologist is the most important step to reach an accurate diagnosis and to generate a comprehensive pathology report that will characterize patient management and prognosis. The initial comprehensive evaluation of lung cancer is a critical step in the management of patients afflicted with this disease. The confirmation of diagnosis and the assessment of the disease as well as the patient is the basis of further treatment decision. This manuscript describes the evaluation of patients with suspected lung cancer as well as the subsequent evaluation after diagnosis, especially in the preparation of potentially curative surgical interventions. Imaging plays an important role in the management of lung cancer. Imaging studies are used for diagnosis and to determine the stage of the disease as well as to assess tumor response and, thus, guide further treatment of patients. This manuscript will review the use of imaging studies in the management of lung cancer. 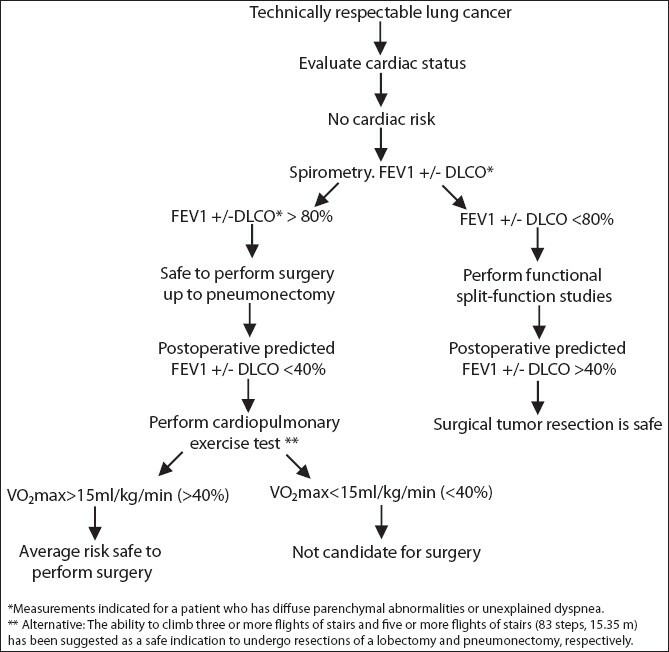 Surgery plays a major role in the management of patients with lung cancer. Surgery is not only the main curative treatment modality in patients with early-stage lung cancer but it also has a significant role in the initial workup for the diagnosis and staging of lung cancer. 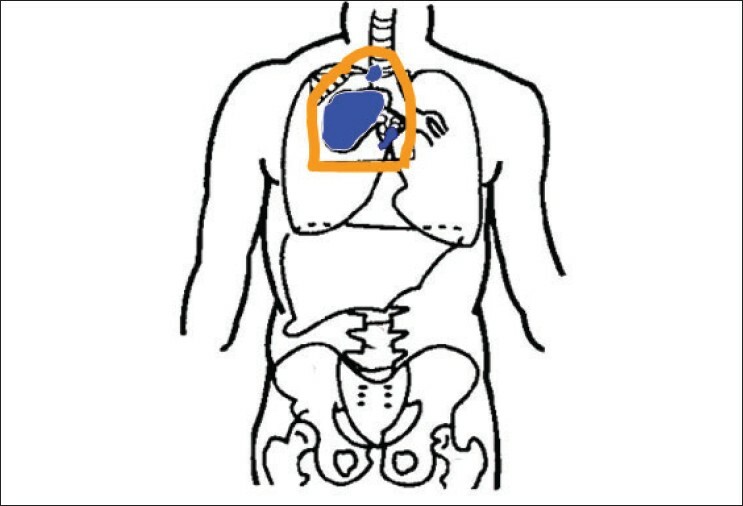 This article describes the surgical management of patients with lung cancer. Surgical resection for lung cancer is still regarded as the most effective method for controlling the primary tumor, provided it is resectable for cure and the risks of the procedure are low. The 5-year survival rare following complete resection (R0) of a lung cancer is stage dependent [Table 1]. [1-3] Incomplete resection (R1, R2) rarely, if ever, cures the patient. Radiation therapy (RT) is an important treatment modality for non-small-cell lung cancer (NSCLC) and has a wide spectrum of applications and indications. Radiotherapy can be used with curative or palliative intent, alone or in combination with another modality-either in sequence or concurrently. In this manuscript, we review the utilization of RT in the treatment of NSCLC. The systemic treatment of lung cancer has evolved rapidly over the last two decades. Systemic therapy has become the standard of care for advanced lung cancer up to the third line. The addition of antiangiogenesis agents to chemotherapy has proved to be beneficial in the first-line setting. Finally, systemic therapy has proven effective in the adjuvant setting in early-stage lung cancer. Small-cell lung cancer (SCLC) accounts for 13-20% of all lung cancers. Stongly associated with smoking and initially responsive to treatment, it results in death within 2-4 months without treatment. Limited-stage disease is treated with curative intent with chemotherapy and radiation therapy, with approximately 20% of patients achieving a cure. Extensive-stage disease is primarily treated with chemotherapy and has a high initial response rate of 60-70% but the median survival is only 10 months. All patients achieving a complete remission should be offered prophylactic cranial irradiation. Relapsed or refractory SCLC has a uniformly poor prognosis. Lung cancer patients have a plethora of symptoms and complications. This manuscript will review two specific entities, namely, superior vena cava syndrome and the skeletal complications of lung cancer.